Remove existing handles and prepare the chest for painting by sanding off all the old paint and cleaning with white spirit. Paint the chest all over with two coats of emulsion and leave to dry. 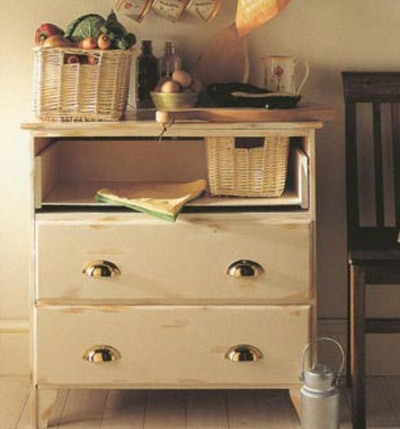 Use fine-grade sandpaper to rub back paint on the edges and corners of the chest to give it a distressed look. Remove the front of the top drawer or, if your chest cannot be taken apart like this, remove the drawer altogether. Put baskets in the top drawer and fix the oyster shell handles on to the lower drawers. What you need: screwdriver, sandpaer in medium and fine grades, white spirit, cloth, off-white emulsion paint, paintbrush, wicker baskets, brass oyster shell handles.